Beraru is a home linen brand start by Anesha Menon. Her love for Kantha embroidery got her to analyse the market to realise that while linear designs in this kind of an embroidery are commonly available, there is not enough choice with Kantha patterns and designs. Anesha sources all her fabric herself from Mumbai designs them herself and then sends them across to the village of Bardhaman in forms of drawings, which is then executed by her team of 6-8 ladies. The best part? It’s all handcrafted. While the embroidery is obviously done by hand, the fabric she sources is also hand-loomed and come from areas in Kerala, Hyderabad and Tamil Nadu. From cushion covers to quilted bedspreads, throws and curtains, all their products revolve around Kantha embroidery. The ladies, who work for Anesha in their spare time from farming, take about a day to make a single cushion cover, while a comforter can easily take up to 10 days to craft.What sets Beraru apart is that they do Kantha designs and patterns (way more tedious) instead of linear continuous stitch patterns. And because it has a polyfill lining, these can be used as both throws and comforters. 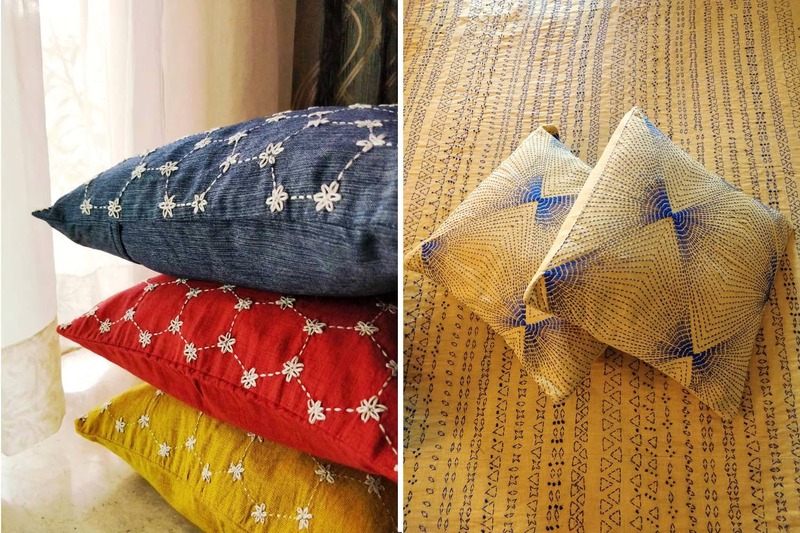 Standard sized square cushion covers are for INR 750, cotton dhurries are priced at INR 1,500, and the Kantha quilted comforters start at INR 3,640. The latest addition to their repertoire are curtains where a high door-sized single piece is priced at INR 1,800. They also sell Kantha embroidered fabrics in bright colours and beautiful designs.You can check out her collection on her Instagram account, or on her website. They also sell out of a store in Borivali West, and you are more than welcome to visit her house in Khar to check the collection there as well. All deliveries within Mumbai are free. But for deliveries in other cities, the charges, quite nominal, are to be borne by the customers. Give your bedroom a sophisticated makeover with throws, comforters and quilted bedspreads from Beraru, a brand that involves hand-loomed fabric and handwoven designs to offer you Kantha embroidered home linen, nothing like anything you’d find in the market.